Some Tesla customers say they now have to fork over an extra $14,000 for their new Model 3 electric cars because of Ontario's sudden decision to end an incentive program for electric and hydrogen vehicles. The provincial government announced Wednesday that the program will end on Sept. 10 for those who have their vehicle delivered, registered, and plated if it was purchased from a dealer, but it ended immediately for those who ordered their electric and hydrogen vehicle directly from the manufacturer. As Tesla does not have dealers and their cars are sold directly to consumers, some Tesla customers say they feel like they've been unfairly targeted. 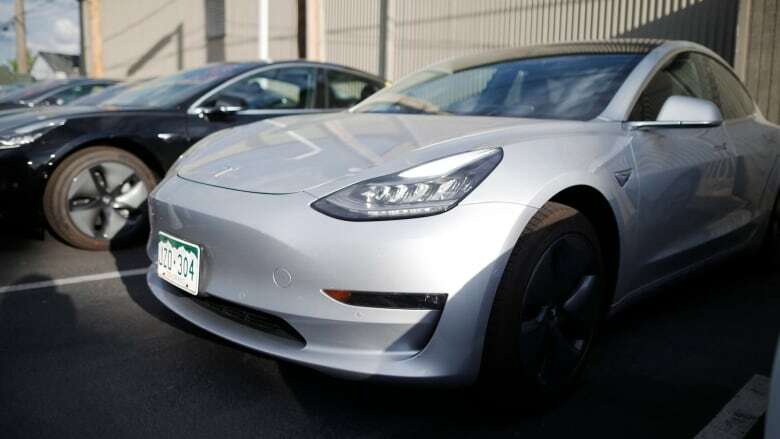 Matthew Cheung told CBC Toronto that his father had been saving up for an electric vehicle for some time, and once the more modestly priced Tesla Model 3, which retails for $45,600, was announced, he felt owning an electric car was finally in reach. While still a bit of a financial stretch, Cheung said his father put down a non-refundable deposit for his "dream car" the day before the election. Cheung said he knew the rebate would be cancelled but expected it to be done in a way where existing orders in progress would be honoured. "The way it was done is unfair and is leaving many Ontario families in a bad place," Cheung said. "The government broke the promise, and in a way that especially singled out a single manufacturer." Kurtis Evans says his family also ordered a Model 3 before the new Progressive Conservative government took power and adds they did so because the provincial government promised "an orderly wind-down of all programs funded out of cap-and-trade carbon tax revenues." "I am devastated by the reversal of what has been communicated to us," Evans said. "The loss of the rebate is going to have an impact on our lives, and will put a greater strain on my family." He says the move by the provincial government only affects middle-class families like his. "This seems to be a decision that benefits traditional dealerships in Ontario," Evans added. "Tesla will be fine. They have 300,000 people waiting to buy my car. They aren't going to be hurt by this at all. It only hurts people like me." Tesla has offered some customers refunds of their deposits. Some experts believe the provincial government's decision will also affect electric vehicle sales. David Adams, president of the Global Automakers of Canada industry association, said Friday that experience elsewhere shows that sales of electric vehicles take a hit when subsidies are removed, such as when British Columbia stopped and then restarted its program. "When they cancelled it, sales went down dramatically, and then when they reinstated it, sales went back up again. That is the same pattern that we've seen in other jurisdictions internationally," he said. Customers generally look for some kind of assistance in overcoming the extra cost of electric vehicles, Adams said. The Electric Vehicle Charging Incentive program was also cancelled Wednesday, but charging stations purchased and/or installed before July 11 will still be able to receive incentives through the program if the application is submitted within 60 days. The electric and hydrogen vehicle and electric vehicle charging incentive programs were cancelled shortly after Ontario ended the cap-and-trade program as a part of cost-saving measures. Both were funded by the cap-and-trade program and were cancelled as a result, according to the Ministry of Transportation. The province says cancelling the cap-and-trade program will help it achieve its goal of bringing gas prices down by 10 cents a litre and cutting costs for Ontarians by $1.9 billion per year.